Crime • Gunned down 20-year-old was wanted for parole violation on robbery, obstructing justice counts. 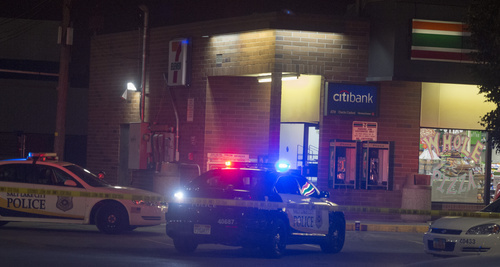 A wanted fugitive fatally shot by Salt Lake City police, who were looking for a man reportedly brandishing a handgun outside a convenience store, was unarmed and trying to comply with police orders when he was killed, his brother claims. 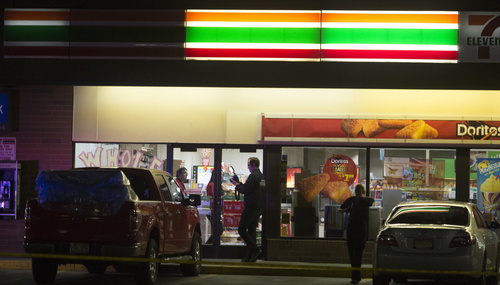 Investigators, citing the ongoing nature of the investigation and need to protect evidence, remained mum on whether a gun was found at the scene of the Monday night shooting at a 7-Eleven store at 2102 S. State St. Police also would not discuss conflicting witness reports that Dillon Delbert Taylor, 20, appeared to have reached toward his waistband during the confrontation. The Salt Lake Tribune on Wednesday submitted formal requests under the Government Records Access and Management Act for both the shooting incident report and the 911 call that purportedly led up to the confrontation. Taylor was facing a felony arrest warrant when police challenged him outside the store, court records confirm. But Taylor&apos;s brother, 22-year-old Jerrail Pete Taylor  who court records show served time on a 2009 second-degree felony robbery count himself  insists that police did not mention the warrant when they approached him, his brother and a third man outside the store. 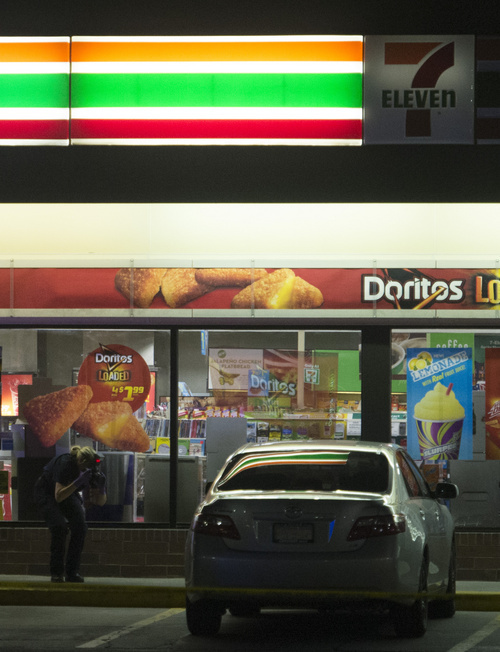 "We&apos;re walking out of the 7-Eleven with a drink, when the cops show up and start harassing us with guns," Jerrail Taylor told The Salt Lake Tribune Tuesday night. 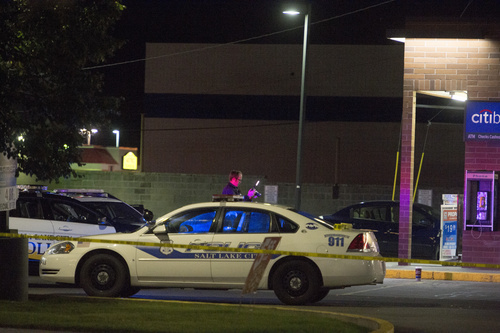 South Salt Lake police, who are investigating the shooting, said Salt Lake City police were answering a 911 call reporting a man there was waving a handgun; Dillon Taylor purportedly matched the description of the armed man. Dillon Taylor was wearing headphones and didn&apos;t respond to the three officers until they surrounded him, Jerrail Taylor said. "He couldn&apos;t hear them, so he just kept walking. Then ... they had guns pointed at his face. That&apos;s when he turned off the music," he said. "I saw them point guns at my brother&apos;s face, and I knew what was going to happen." "He got confused, he went to pull up his pants to get on the ground, and they shot him," Jerrail Taylor said. South Salt Lake police Sgt. Darin Sweeten said Dillon Taylor, who allegedly had gang affiliations according to court documents, reportedly was "belligerent." Sweeten said he could not discuss further details as to whether Taylor reached for anything in his clothing, threatened or attacked the officers, or was armed. Jerrail Taylor insists his brother had no gun. "I was with him the whole time," he said. "If you look at 7-Eleven cameras, they&apos;ll tell you the same thing." Taylor was facing a $25,000 arrest warrant for allegedly violating probation he received for robbery and obstructing justice; he was arrested July 31 in North Salt Lake for being drunk and interfering with the arresting officer, according to an affidavit filed with the court. Taylor also had failed to maintain full employment, complete a mental health evaluation or complete a substance abuse evaluation, all conditions of his probation, according to the affidavit. Taylor expressed an intense feeling of doom, and determination not to go back to jail as a result of the warrant, issued Aug. 7. "I feel my time is coming soon, my nightmears [sic] are telling me," he wrote that day on Facebook. "ALL my family has turned and snitched on me. I&apos;ll die before I go do a lot of time in a cell. I&apos;m trying to strive and live but [I&apos;m] done litrerly [can&apos;t] stand breathing and dealing with s-. I feel like god [can&apos;t] even save me on this one. ... this time [it&apos;s] me and the demons [I&apos;m] fighting." 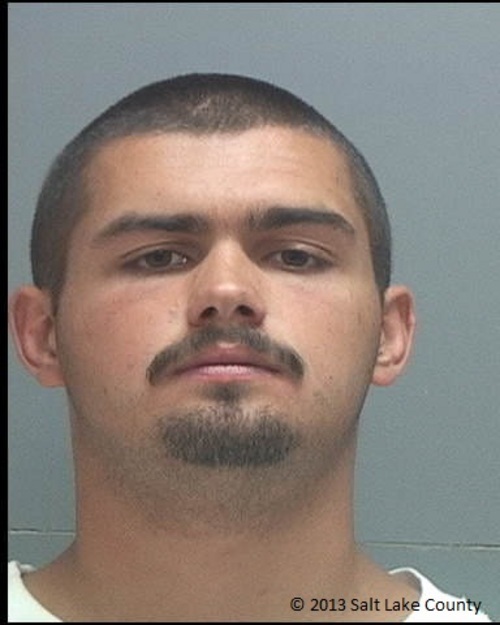 Third District Court records show that Taylor pleaded guilty to a reduced count of second-degree felony robbery in connection to thefts at a Beto&apos;s restaurant and another 7-Eleven in South Salt Lake in May of 2012. Taylor&apos;s co-defendant grabbed the tip jar at Beto&apos;s, according to court documents. 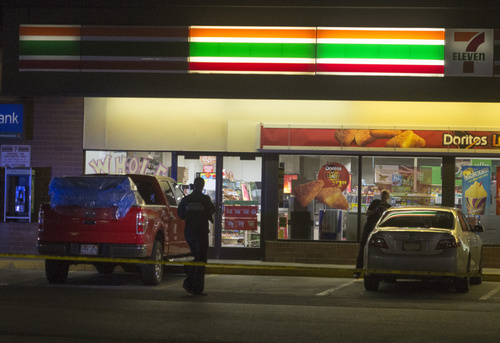 About an hour later, Taylor&apos;s co-defendant stole a case of beer at a 7-Eleven at 2700 S. Adams St. (450 East). When the clerk followed him to a car, Taylor placed a hand into his waistband and told the man, "Don&apos;t be a hero ... or I&apos;ll ... shoot you," according to court documents. In an unrelated obstructing justice case in August 2012, Taylor threatened a co-defendant in the robbery case, as well as his wife and daughter, and called the co-defendant "a ... snitch," according to court documents. Taylor received suspended prison terms and probation in both cases. "He was just a fun kid. He&apos;d always turn a bad situation into a good one," Jerrail Taylor said. Three officers involved in Taylor&apos;s shooting have been placed on administrative leave pending an investigation, which is being conducted by the neighboring South Salt Lake Police Department. As for Jerrail Taylor, he was released on parole April 23 after serving 26 months of a 0-to-15-year prison term, according to Department of Corrections spokeswoman Brooke Adams.